*under 10 refers to 10 and under to a pound, these can cost a pretty penny so you can definitley substitute a smaller shrimp (under 15, under 20 ) etc. Both Joel and I were raised around shrimp our whole lives and have very particular taste where shrimp is concerned. 2 lbs. shrimp ( we used under 10’s which are rather large ) you can use smaller ones. Joel prefers Mexican Whites, and you can ask for these ( Ocean Garden is our preferred brand) they come in a 5 lb. box and Joel cleans and deveins for me always. (that’s our deal) He cleans them and I cook them. 1 lb. spaghetti ( we used a thin spaghetti) or angel hair, capelini etc. Cook Pasta according to directions. 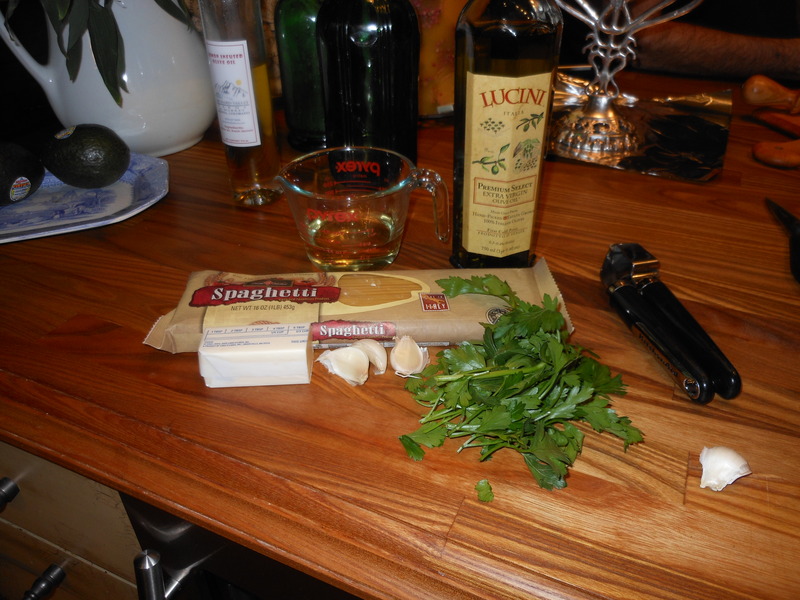 Start boiling water for pasta as you start your sauce. Heat oil in a heavy 12 inch skillet over medium-high heat until hot, but not smoking. Saute shrimp, turning until just cooked through, about 3 – 4 minutes depending on the size of your shrimp. These were large and took a bit longer, they will start to curl and turn a pretty pink color. If you’re really not sure you can always cut into one and if it is translucent put it back till it is opaque in the inside, we don’t want to be serving raw shrimp to anyone. When shrimp is done remove with a slotted spoon to another bowl. Set aside. Add garlic to oil, if you think you need more oil just put a bit in now, add the red pepper flakes now if you’re using them, wine, salt, and pepper and cook over high heat , stirring occasionally, about 2 minutes or so. Add butter to skillet , stirring until melted, and stir in shrimp. Remove skillet from heat. Drain pasta in a colander, and *reserve 1 cup of pasta water. Toss pasta well with shrimp mixture and add parsley in a large bowl, add additional reserved pasta water if necessary to keep it moist. * Just a little tip, before the pasta is finished I scoop out some pasta water with a measuring cup, makes it easier than juggling boiling water while you’re draining it. 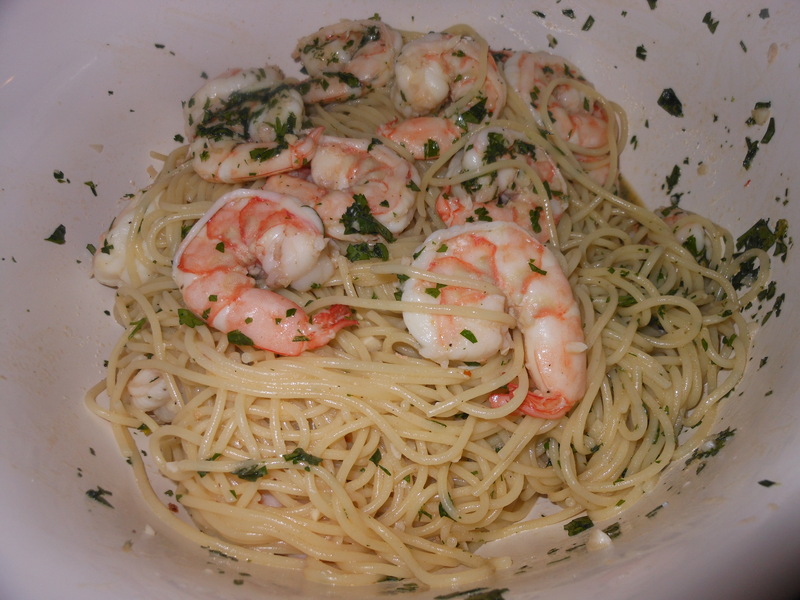 This entry was posted in pasta, Sauce, seafood and tagged Scampi with Shrimp and Pasta, Shrimp in a Scampi Sauce, Shrimp Scampi with Pasta. Bookmark the permalink. i am making this tonite!!!! i can’t wait! happy new year!!! i will let you know how it turns out! wowie!!!! TO DIE FOR!!! i highly recommend this recipe! the store didn’t have flat leaf parsley, so i used curly and it worked just fine! thanks candi!